The health of the Hammock Dunes Owners’ Association (HDOA) begins with the selfless contributions of the many volunteers who serve on its Board and committees. These volunteers work diligently and in a fiscally responsible way to maintain and enhance our premier community. In addition to the HDOA Board consisting of members with diverse backgrounds, including the legal, financial, and development fields, the HDOA also retains legal and accounting firms plus a property management company to ensure fiduciary oversight and to carry out day-to-day community management. Both the HDOA Master Association and the individual Neighborhood Associations maintain very strong balance sheets, operating well within their annual budgets. Annual budgets not only protect reserve accounts set aside to maintain and/or replace the community’s landscape and hardscape infrastructure, but also contribute to these reserve accounts based on the remaining useful life of each asset. Property owner monthly dues are assessed based on these reserve contributions plus forecasted operating expenses, including contactor maintenance, security and property management, insurance, and the loan associated with the June 2013 purchase of the remaining developer assets. An annual audit by a third-party accredited accounting firm ensures financial oversight and provides Hammock Dunes owners with the confidence that the HDOA Board is properly executing its fiscal responsibilities. Even during the recent real estate downturn, the various boards’ careful financial management enabled the community to weather this downturn while remaining financially sound. For the less than 2% of owners who defaulted in paying their assessed dues during the downturn, the HDOA applied property liens covering past due assessments and now successfully collects these past due amounts when these properties are resold. The HDOA’s ability to apply a property lien on owners who are more than 90 days in arrears helps ensure long term financial security for the community. To further ensure the long term health of the community, the HDOA completed, in June 2013, a $1.8 million purchase from HD Associates, LP of the remaining developer assets, including the Declarant Rights that govern Hammock Dunes. Through this acquisition, the HDOA now exclusively controls the future of Hammock Dunes as the “Developer”. It’s important to note that our acquisition of these remaining assets did not significantly impact our strong financial position, nor does it affect any of the HDOA’s restricted financial reserves, which are set aside for annual maintenance and long term replacement of the community’s infrastructure. In fact, some of the assets associated with the purchase are now generating revenue to help pay off the loan associated with this acquisition. Declarant Rights: By-laws, Master Documents, and Covenants, Conditions and Restrictions (CCRs) plus all developer intellectual property. 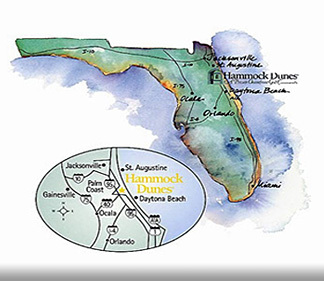 These documents define the Hammock Dunes developer’s roles and responsibilities, the development vision, and the community governing rules and standards, including infrastructure, landscape, architectural, and rental restrictions. Two Camino Office Complex: Commercially zoned 2.46 acre parcel with a 6,018 sq. ft. building, located at the front entrance to Hammock Dunes. Historically, the developers utilized this office complex to market Hammock Dunes properties. This acquisition allows us to protect the first impression that owners, visitors, and potential buyers have as they enter Hammock Dunes. The HDOA currently leases this complex to SSMG, its community management company, and this lease generates a revenue stream to help pay down the asset purchase loan. DCDD Connection and Standby Charge Agreement: This “Connection Fee Agreement” between the Dunes Community Development District (DCDD) and “Agreement Holder” (now the HDOA) requires the DCDD to pay the HDOA $3,500 of the total $4,500 connection fee that the DCDD charges Hammock Dunes lot owners for a water/sewer connection during initial construction on their lots. With over 200 lots remaining available for new construction, and with the recent acceleration in new home construction, this agreement provides an additional revenue stream to pay down the asset purchase loan.